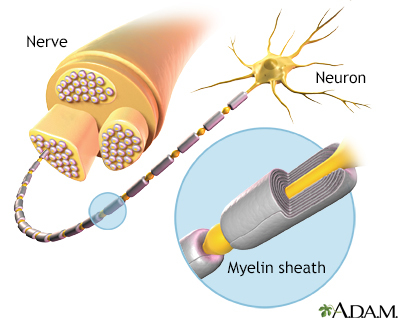 Destruction of myelin, a fatty insulation covering the nerve fibers, is the main characteristic of MS. The end results of this process, called demyelination, are multiple patches of hard, scarred tissue called plaques or lesions. Sclerosis comes from the Greek word skleros, which means hard. Relapsing-Remitting MS. Relapse-remitting MS (RRMS) is the most common form of MS. About 85% of patients are first diagnosed with this type of MS. RRMS is marked by flare-ups (also called relapses or exacerbations) of symptoms followed by periods of remission when symptoms improve or disappear. Secondary-Progressive MS. Some people with RRMS go on to develop secondary-progressive (SPMS). (For many people, treatment with disease-modifying medications helps delay this progression.) In SPMS, the disease course continues to worsen with or without periods of remission or leveling off of symptom severity (plateaus). Primary-Progressive MS. About 10% of people are diagnosed with primary-progressive MS (PPMS). In PPMS, symptoms continue to worsen gradually from the very beginning. PPMS has no relapses or remissions. There may be periods of occasional plateaus. This type of MS is more resistant to the medications typically used to treat the illness. Progressive-Relapsing MS. Progressive-relapsing MS (PRMS) is a rare form of MS, occurring in less than 5% of people. It is progressive from the start with intermittent flare-ups of worsening symptoms along the way. There are no periods of remission. Click the icon to see an image depicting multiple sclerosis. Multiple sclerosis is not hereditary, but genetic factors appear to make some people more susceptible to the disease. The most significant genetic link to MS occurs in the major histocompatibility complex (MHC), a cluster of genes on chromosome 6 that are essential for immune system function. A much smaller percentage of MS cases may be due to variations in interleukin-7 (IL-7) and interleukin-2 (IL-2) gene receptors, which are also related to immune system regulation. Infectious organisms, mainly viruses, have long been suspects. They include Epstein-Barr virus (the cause of mononucleosis), herpesvirus 6, herpes simplex virus, influenza, measles, mumps, varicella-zoster virus, cytomegalovirus, respiratory syncytial virus, canine distempre virus, and Chlamydia pneumoniae. However, no direct link has been proven between these infections and multiple sclerosis. There is no evidence that any type of vaccination causes multiple sclerosis. Research suggests that low blood levels of vitamin D may increase the risk for developing MS, and for worsening the course of the disease in its early stages. Clinical trials are currently evaluating whether vitamin D supplements may help slow disease progression and improve clinical outcomes. Vitamin D may be effective in decreasing fatigue and improving quality of life for those with MS. Symptoms of multiple sclerosis (MS) appear in a variety of ways. Most people first have a single attack of symptoms, a neurological episode called a clinical isolated syndrome, which typically occurs between the ages of 20 and 50. Initial symptoms may be mild enough that people do not always seek medical care. Once a second attack occurs, the person is considered to have relapsing-remitting MS. Much less commonly, the disease is progressive from the start, with more or less continuous symptoms. Symptoms in MS depend on the location of the nerve lesion. Not all symptoms affect all people. Vision Problems. Optic neuritis, inflammation of the nerves in the eye, is a common early symptom. People may initially experience blurred or double vision, often because of problems with one eye. Most people usually have good recovery from the first attack. However, with recurrent attacks and as the condition progresses, vision loss increases, although total blindness is rare. Tingling and Numbness Sensations. Tingling, crawling or burning sensations (paresthesia), or loss of sensation, can occur. There may be sensations of intense heat or cold. Symptoms often begin at the end of the legs or arms and move up towards the beginning of the limb. Lhermitte sign, which is caused by lesions in the spinal cord in the neck, is an electrical buzzing sensation that runs down the back and into the legs. It occurs when bending the neck forward. Muscle Weakness and Spasms. People may feel weakness, clumsiness, or heaviness in the limbs. They may have difficulty with finger dexterity. Muscle spasms and stiffness (spasticity), particularly in the legs, occur in an initial attack of MS in nearly half of people. Problems with Balance and Coordination. People may have difficulty walking normally and keeping their balance due to unsteady gait. They may have trouble grasping small objects. These problems can be worsened by other common MS symptoms, such as dizziness and tremor. Ataxia (lack of muscle coordination) and tremors (shaking or trembling of limb) are also common. Fatigue. Fatigue is the most common and debilitating symptom of MS and often occurs early in the disease. Fatigue is typically worse in the late afternoon and improves in te early evening. Infections. Viral and bacterial infections, including urinary tract infections, may provoke MS symptoms. Heat and Cold. Sudden changes in temperature or humidity can trigger symptoms. Many people with MS have heat intolerance and find that heat worsens their symptoms. Stress. Emotional and physical stress may worsen MS symptoms. Most people with MS first seek medical help after an initial attack of symptoms, called a clinically isolated syndrome (CIS). Not all people who have a CIS go on to develop MS, and it is difficult to predict who will or will not. A diagnosis of MS is based on results from a combination of various tests. They include medical history, neurological exam, magnetic resonance imaging (MRI) scans, evoked potential tests, and possibly a spinal fluid test. Click the icon to see an image of a brain MRI. Over a third of people will progress even with immediate treatment, but without early treatment about half of patients will progress to clinically identifiable MS.
Zinbryta (daclizumab). Given as a long-acting injection that is self-administered by the patient monthly. The interferon drugs (Betaseron, Extavia, Avonex, Rebif, and Plegridy) and glatiramer acetate (Copaxone) are given by self-injection at home. Natalizumab (Tysabri) and mitoxantrone (Novantrone) are given by intravenous infusion in a hospital or medical clinic setting. Fingolimod (Gilenya), teriflunomide (Aubagio), and dimethyl fumarate (Tecfidera) are taken by mouth as pills. Most of these drugs are taken on a long-term basis. They can help reduce disease activity and progression for relapse-remitting MS (the most common form of MS) and other types of MS that have relapses (secondary-progressive MS, progressive-relapsing MS). At this time, there are no proven treatments for primary-progressive MS. Disease-modifying drugs can have significant side effects. If disease-modifying drugs do not work, doctors may try other drugs that are not specifically approved for MS. They include intravenous immunoglobulin (IVIg), methotrexate, azathioprine (Imuran), and cyclophosphamide (Cytoxan). Dalfampridine (Ampyra) is approved to improve walking in people with MS. In clinical trials, people treated with dalfampridine had faster walking speeds than those who received placebo. Dalfampridine is taken as a pill. The drug may cause seizures. OnabotulinumtoxinA (Botox) is approved to treat upper limb spasticity in the flexor muscles of the elbow, wrist, and fingers. It is also approved to treat urinary incontinence associated with certain neurological conditions, including multiple sclerosis. Botox is given by injection into affected muscles. Glatiramer acetate (Copaxone) is a synthetic molecule that resembles a basic protein found in myelin. It is not known exactly how this medication works in treating MS. It may act as a decoy to trick white blood cells into attacking it instead of myelin. It may also affect the proportions of immune cells that promote or inhibit inflammation. Glatiramer acetate is approved to help reduce the frequency of relapses in people with relapse-remitting MS. It comes in pre-filled syringes and is given by subcutaneous (under the skin) injections. The FDA has approved Zinbryta (daclizumab) for the treatment of adults with relapsing forms of MS. 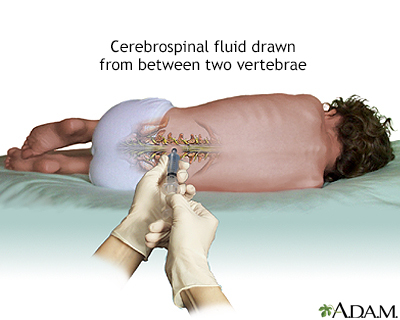 It is given as a long-acting injection that is self-administered by the patient monthly. Ocrelizumab is under consideration with an accelerated review process by the FDA for treatment of primary progressive and relapsing remitting MS. An analog of ocrelizumab called rituximab (Rituxan), is often used on an off-label basis to treat patients with MS who are not responsive to traditional therapies. Cumulative doses can have toxic effects on the heart, including heart failure, so the drug is only used for a limited period of 2 to 3 years. You should get a heart evaluation, including evaluation of left ventricular ejection fraction (LVEF), before starting this drug and before each dose administration. Mitoxantrone can also increase the risk for leukemia. Because several other treatments for MS with less toxicity are now available, mitoxantrone is not used as frequently these days. Fingolimod (Gilenya) was the first oral drug approved to treat relapsing forms of MS. (The other two oral drugs are teriflunomide [Aubagio] and dimethyl fumarate [Tecfidera].) Fingolimod is taken once-daily as a pill. Physical Therapy. Physical therapists provide professional guidance on exercise programs. They can also advise on how to best use mobility aids (such as canes, crutches, and scooters) and other assistive devices. Occupational Therapy. Occupational therapists help people learn how to improve their functioning and independence within their home and workplace environments. They can provide professional advice on what sort of adaptive tools, such as grab bars, should be used in the bathroom, bedroom, and kitchen. Vocational Therapy. Vocational therapists provide guidance on how to best manage in the workplace. Speech/Language Therapy. Speech and language therapists treat problems with speech and communication. They can also help address problems with swallowing. Psychological Therapies. Psychotherapy can help patients and their families cope with the emotional aspects of living with MS. Some people with MS may benefit from cognitive-behavioral therapy to help develop techniques for dealing with and overcoming negative thought patterns. People with MS should try to engage in a variety of exercises including stretching, muscle strengthening, and range-of-motion. Exercise can help reduce fatigue and relieve muscle spasticity, and it can help your mind and spirit as well as your body. A physical therapist can suggest exercise programs that are best for you, and help set realistic goals. MS symptoms worsen during a cold or the flu, probably because of increased immune system activity and fever. People with MS should receive a flu shot in the fall. However, they should not take the nasal spray version of the flu vaccine (FluMist Intranasal). Unlike the flu injection vaccine, which uses an inactivated virus, FluMist contains a live virus. Live virus vaccinations may be harmful for people with MS, especially those who take immune-suppressing drugs. Marijuana (Cannabis). Synthetic pill or oral spray forms of cannabis, commonly called marijuana, may help ease MS spasticity and pain, according to recent guidelines from the American Academy of Neurology. Dronabinol (Marinol) and nabilone (Cesamet) are pills that contain a synthetic form of the THC chemical found in marijuana. These pills are approved in the United States for treating cancer-associated nausea and vomiting, but are not approved for MS. Nabiximols (Sativex) is an oral spray currently approved in 25 countries, but not the United States, to treat MS spasms. (Nabiximols may also help with frequent urination.) The AAN finds inadequate evidence to recommend for or against smoking marijuana to treat MS symptoms. A 2015 trial found that this drug did not improve function in patients with MS.
Gingko Biloba. There is some evidence that the herbal remedy ginkgo biloba may help reduce fatigue, although not a cognitive (thinking or memory) problems. Gingko biloba may cause an increased risk for bleeding when used at high doses. This herb can also interact with high doses of vitamin E, anti-clotting medications, aspirin, and NSAIDs. Vitamin D. Vitamin D supplements are helpful for people with low levels of vitamin D in their blood. Vitamin D strengthens bone and may help prevent osteoporosis. A recommended daily dosage is 400 to 800 IU. For people with vitamin D deficiency, 1000 IU may be recommended. Vitamin D deficiency may be associated with worsening symptoms during the early course of MS. It is still unclear whether vitamin D supplementation can help slow MS disease progression. Antioxidant Vitamins. The MS disease process may be partly due to oxidation. However, no studies have proven the effectiveness of antioxidant vitamins (such as vitamins C and E) for MS. In addition, antioxidants may possibly activate T cells and macrophages (inflammatory components of the immune system) and might theoretically pose some danger to patients. Small studies to date have not found any worsening of the disease from taking vitamin supplements, but patients should be cautious. Bee Venom. For years, anecdotal reports have claimed that bee stings relieve some MS symptoms. No studies have confirmed any benefits. Bee venom contains many chemicals, some of which can cause severe and sometimes deadly allergic reactions in some people. Linoleic Acid. Linoleic acid, commonly known as evening primrose oil, is a polyunsaturated fatty acid believed by some people to be helpful because myelin is composed of fatty acids. No study has proven that it is beneficial, but it does not appear to cause any harm. Achiron A, Givon U, Magalashvili D, et al. Effect of alfacalcidol on multiple sclerosis-related fatigue: a randomized, double-blind placebo-controlled study. Mult Scler. 2015;21(6):767-775. PMID: 25344375 www.ncbi.nlm.nih.gov/pubmed/25344375. Ascherio A, Munger KL, White R, et al. Vitamin D as an early predictor of multiple sclerosis activity and progression. JAMA Neurol. 2014;71(3):306-314. PMID: 24445558 www.ncbi.nlm.nih.gov/pubmed/24445558. Bloomgren G, Richman S, Hotermans C, et al. Risk of natalizumab-associated progressive multifocal leukoencephalopathy. N Engl J Med. 2012;366(20):1870-1880. PMID: 22591293 www.ncbi.nlm.nih.gov/pubmed/22591293. Ball S, Vickery J, Hobart J, et al. The cannabinoid use in progressive inflammatory brain disease (CUPID) trial: a randomised double-blind placebo-controlled parallel-group multicentre trial and economic evaluation of cannabinoids to slow progression in multiple sclerosis. Health Technol Assess. 2015;19(12):vii-viii, xxv-xxxi, 1-187. PMID: 25676540 www.ncbi.nlm.nih.gov/pubmed/25676540. Chataway J, Schuerer N, Alsanousi A, et al. Effect of high-dose simvastatin on brain atrophy and disability in secondary progressive multiple sclerosis (MS-STAT): a randomised, placebo controlled, phase 2 trial. Lancet. 2014;383(9936):2213-2221. PMID: 24655729 www.ncbi.nlm.nih.gov/pubmed/24655729. Confavreux C, O'Connor P, Comi G, et al. Oral teriflunomide for patients with relapsing multiple sclerosis (TOWER): a randomised, double-blind, placebo-controlled, phase 3 trial. Lancet Neurol. 2014;13(3):247-256. PMID: 24461574 www.ncbi.nlm.nih.gov/pubmed/24461574. Giovannoni G, Gold R, Selmaj K, et al. Daclizumab high-yield process in relapsing-remitting multiple sclerosis (SELECTION): a multicentre, randomised, double-blind extension trial. Lancet Neurol. 2014;13(5):472-481. PMID: 24656609 www.ncbi.nlm.nih.gov/pubmed/24656609. Kappos L, O'Connor P, Radue EW, et al. Long-term effects of fingolimod in multiple sclerosis: the randomized FREEDOMS extension trial. Neurology. 2015;84(15):1582-1591. PMID: 25795646 www.ncbi.nlm.nih.gov/pubmed/25795646. Kieseier BC, Arnold DL, Balcer LJ, et al. Peginterferon beta-1a in multiple sclerosis: 2-year results from ADVANCE. Mult Scler. 2015;21(8):1025-1035. PMID: 25432952 www.ncbi.nlm.nih.gov/pubmed/25432952. Kuehn BM. FDA warns about the risks of unproven surgical therapy for multiple sclerosis. JAMA. 2012;307(24):2575-2576. PMID: 22735405 www.ncbi.nlm.nih.gov/pubmed/ 22735405. Mancardi GL, Sormani MP, Gualandi F, et al. Autologous hematopoietic stem cell transplantation in multiple sclerosis: a phase II trial. Neurology. 2015;84(10):981-988. PMID: 25672923 www.ncbi.nlm.nih.gov/pubmed/25672923. Miller AE, Wolinsky JS, Kappos L, et al. Oral teriflunomide for patients with a first clinical episode suggestive of multiple sclerosis (TOPIC): a randomized, double-blind, placebo-controlled, phase 3 trial. Lancet Neurol. 2014;13(10):977-986. PMID: 25192851 www.ncbi.nlm.nih.gov/pubmed/25192851. Traboulsee AL, Knox KB, Machan L, et al. Prevalence of extracranial venous narrowing on catheter venography in people with multiple sclerosis, their siblings, and unrelated healthy controls: a blinded, case-control study. Lancet. 2014;383(9912):138-145. PMID: 24119384 www.ncbi.nlm.nih.gov/pubmed/ 24119384. Voskuhl RR, Wang H, Wu TC,et al. Estriol combined with glatiramer acetate for women with relapsing-remitting multiple sclerosis: a randomized, placebo-controlled, phase 2 trial. Lancet Neurol. 2016;15(1):35-46. PMID: 26621682 www.ncbi.nlm.nih.gov/pubmed/26621682.